Is Inhibition in Aikido and Tai Chi? F.M. Alexander never claimed to have an exclusive ownership trademark on excellent coordination or the path to effortlessness and mastery. He merely figured out how to eliminate a nuisance that he had cultivated and trained into an intended habit by accident. Put yourself in F.M. 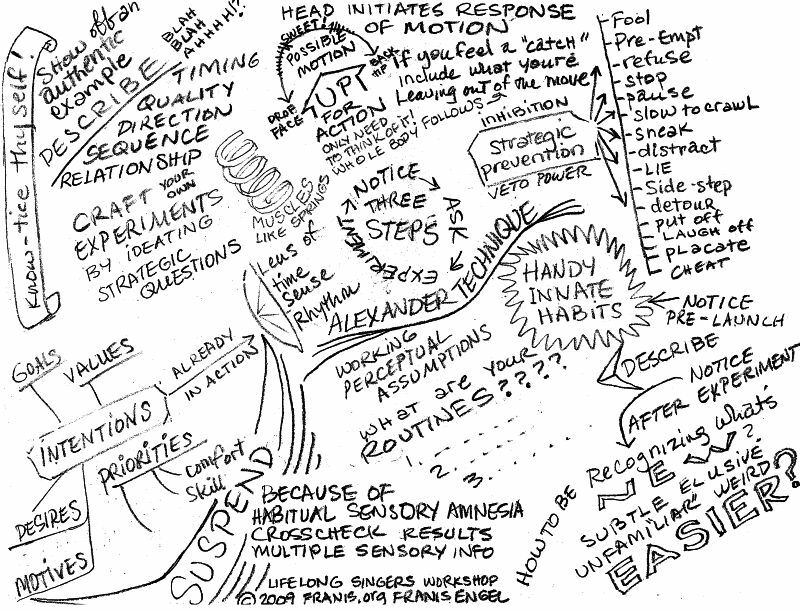 Alexander’s shoes – how would you describe what you did, as if nobody had ever described the process of inhibition? It’s a squirrelly, tricky challenge for self-observation AND the use of language to describe what happened. All of these things happen step by step and/or simultaneously all-at-once – very quickly – AND they don’t happen the same every time either. It was an admirable and stunning success on Alexander’s part to come up with ANY way to describe the abstracted principles so they could be applied to ANY movement. Alexander’s work was a brilliant insight in applying creative thinking ability toward a practical discipline of the proof of thought in action. Other philosophers (and religions!) had some similar ideas – without the practical application and proof their ideas worked because it was assembled into a “law” or “principle” as Alexander developed. If you have experience with Alexander Technique, here’s your assignment: In your own words, describe in language what inhibition is, without going through the blow-by-blow nuts & bolts of how to do it. Inhibition is prevention of unwanted, nuisance habits of movement that have been trained to disappear while becoming innate. Using inhibition prevents long-standing habits from obliterating a fragile, newly intended potential talent. Inhibition prevents what is previously known best to be stopped or suspended, so an unknown potential may emerge well-formed, be practiced and become another reliable skill. Do you agree with that definition of inhibition? Stated like that, inhibition sounds like the basis of all educational processes, doesn’t it? So once you do describe inhibition, it is more obvious that it can be used a stand-alone principle. Inhibition may operate quite independently of Primary Control. (Another important principle of Alexander Technique.) Inhibition can be ANYTHING strategically done to prevent, sidestep, re-direct, fake out, detour, put off, distract, bore (the list is only limited to your creative ability to come up with effective variations) lie, cheat, make fun of, bait & switch, etc. that unwanted, coercive habitual reaction. Absolutely! Someone who practices can excel at a sport, but effective teaching is a separate skill. Not many teachers know that prevention – inhibitive techniques exist specifically. But some rare teachers are able to improvise specific solutions for specific students who are having problems and need help overcoming specific issues. This is the value of a good teacher – to obviate difficulty and prevent it. Teachers in general often don’t know why what they do works, (or why some students have trouble and others excel.) – Of course, we Alexander Technique people do know why some people excel at learning and some don’t, because we have the Alexander Technique as an example and descriptor. However, the challenge here is to think abstractly to apply principles beyond the specific situation where these principles were learned. So – what I’m saying here is that anybody may use inhibitive strategies – without knowing that these inhibitive techniques are a separate, defined skill/ability. Mostly people do not have a clue that inhibition is the MOST important key to success in many, many situations. This is because, so often, you must stop what you do not want before you can begin to allow what you do want. Most people merely think of the “doing what you want” part. So they are left to wonder why their intention falls short. Usually they imagine it is something wrong with THEM. But that doesn’t mean a student’s teacher misses noticing what they want for their student that the student does not know. This depends on the teaching style, insight & experience of the particular teacher. With an effective and intuitive Sensei, (or any teacher) who is practiced at timing & reinforcement in training, coupled with an exacting standard of “effortlessness” as a guiding criteria of success – you essentially have exactly the same result as with using Alexander Technique. It is of no difference that it is not named that particular thing and even that the learning process is described differently. Almost any skill may become an “art” of life with a valuable teacher. Inhibition is a short-cut. The recommendations of how these other two disciplines are taught (I speak from experience with both of Tai Chi and Aikido) are the long way ’round and require even more dedication and practice than Alexander Technique lessons. All of them work toward the similar objectives of freedom of movement, pleasure of learning, prevention of unnecessary pain and enhancement of longevity. Despite the way these objectives are described being quite different because of the culture surrounding it, (IMHO) I see more commonalities than differences. What do you have to say about other disciplines or pastimes that have the ability to ascend to an art, containing philosophical principles or lessons of life? Lutz: Alexander Technique as a way to enlightenment without life-time membership and obligations? At the Hellish Penalty of being a Lousy Example to one’s Devotees, umm, Devoted Pupils, (who inevitably will emulate the example’s affectations… ummm… pattern of misuse if presented with it at an unthinkable momentary lapse of Direction.) The Obligatory Dedication to a lifetime of Directing Oneself…will be required. OF course, we would need to select members of the Upper Caste. They must deal with the inevitable Continuing Rising Standards of excellence and perfection of the transcendent pursuit of Good Use In Every Moment. Since it takes at least one contiguous month to Improve One’s Use and get it to stick, the identification of A.T. into a religion would be the solution of that sticky challenge of having pupils flake out before they are Properly Indoctrinated. Once pupils open the door on expanded perception, they should not be allowed to slam the Doors of Perception shut again. Merely require pupils to live together for a month-long workshop in order to Study Properly. Maybe it would be a better idea to require those advanced enough in our Doctrine to tutor a flock by obligation in exchange for their ten-year training. We could cloister them in subsistence housing for another period of ten years (after the first ten years,) at which end they might be be qualified to be deified as Highly Enlightened after death. Hey, at least they would have a job! Of course, the manner of death would be a factor in Deification, because, the only preferred spiritual enough cause of death is stroke – and THAT is only acceptable after attaining 90+ years old. Preferably after a previous stroke recovery to prove how effective the Deified Candidate can Carve New Brain Pathways in the example of our En-light-end Hero, F.M. Alexander himself. Hmmmm, if Alexander Technique were a religion, then we could consider membership in the professional societies to be tithing! p.s: AND converting Alexander Technique to being a religion would allow tax write-offs! Anger is an intense emotion. Anger is an emotion that most people would not really prefer to keep hold of for very long because it results in fight or flight reactions and if kept going indefinitely in the background as a sustained emotion – health problems. Which emotion, pastime or action is in force is beside the point. Curious if it’s possible to surpass any intense emotion, intense enough to distract reason. It’s been proved that strong emotions interfere with creative thinking ability and common sense. Defensiveness and self-protection seems to preclude creative and reasoning ability. Aside from why it’s not possible, have some people done it? Is it possible to actually think, problem solve and come up with something new if you’re in the throes of anger, defensiveness or other intense emotional self-involvement? Perhaps it’s the self-deception that is the culprit? I know it’s possible to creatively problem solve while also being angry. I’ve done it myself. It happened because I was challenged to do so repeatedly without the usual characteristic of defensive self-preservation being a feature. If I did it, I know it’s possible for others to do so. From this personal experience, I know that it’s possible to marry precluding “opposing” characteristics so that having and either/or is not necessary. You can have both, and sometimes you can have it all – up to a point. The ability to think well while under pressure is unusual because the intensity and the nature of the emotion will shut down the ability to think. People who are angry in this way are similarly blinded. Ego is necessary in threatening situations because it’s primal survival imperative. People can be distracted by being absorbed in any habitual state – emotional, physical, mental. People when they are freaking out get distracted by their status quo expectations and fears. They space out and miss stuff they’re not anticipating that could be useful, because it’s not what they expect. So – perhaps the ability to STOP, PREVENT or SUSPEND is the crucial one activity that is CRUCIAL to model if you’d like to gain some way to solve a situation during the throes of an intense emotion. Whatever the habit that is in place, in the way of flexibility is the ability to respond to circumstance appropriately. A style of coercive assault that accuses, (provoking a defensive reaction) is a dangerous circumstance to resist constructively. Whereas, nobody blames an earthquake or a big wave for being what it is. The relative importance of what you’re getting upset about depends on if you have someone around you who is doing one of these provoking reactions on a repetitive basis that you are, in some way, forced to deal with. It’s certainly challenging and a little poisonous to have to deal with a person who constantly demands attention who is not physically ill or a child. There are many other situations that can encourage someone to go into a panic – reasonably. Earthquakes. Fires. An accident, etc. One way to practice the ability to suspend one’s reaction to circumstance and choose differently is to learn it and practice it by studying Alexander Technique. I’m very curious to find out if, in general, do people who study Alexander Technique find they are better able to respond intelligently during genuine emergencies or able to problem solve during intense emotions? Had a friend who lived in Chicago and had worked with Goddard Binkley. In lessons, my friend reported that Binkley would have my friend shout out emotionally charged phrases during hands-on lessons. Has anyone else had these sorts of psychological activities encouraged during Alexander Technique lessons from past teachers? I just wrote this post, adding to what was already on this wiki on Alexander Technique. It’s released on a Creative Commons license. This aspect of Alexander Technique comes close to the Buddhist practice of ‘mindfulness’. Alexander’s principles about self-awareness adds additional interesting points to other methods that have the goal of inviting more sensory awareness into your life. A sign that you could benefit from learning about your awareness by studying Alexander Technique would be surprise at having apparently taken a wrong turn, due completely to habit. Finding habitual routine driving your actions and not your intentional, conscious awareness can be somewhat unsettling. Habits are designed to become innate in order to become reliable. Once we know how to do things, gaining competence allows us to perform the task ‘without thinking’. Driving a car is a good example for this. Primates haven’t evolved to drive cars without learning it as a new skill. Yet our human nervous system happily adapts to this ‘remote controlled’ movement as we trained ourselves to get used to driving cars. We do this training as a series of behavior chained actions, linked together in a sequence. Once we know the skill of driving, we are usually much more aware of our goals of where and why we want to go to our destination than about the details of shifting gears or using the steering wheel. Sometimes, on a familiar route, we might completely run on ‘auto pilot.’ Evidence of this is not noticing anything on our way, except perhaps the beginning and end of our journey. So it is quite understandable to become a slave to one’s own habitual routine. Thus, we notice the need for learning a little more about how our awareness and responses work. That difference is awareness. We can do a routine skill with awareness and be satisfied with it. Or we can allow and enjoy habit running its automatic program and use our awareness to glide over the top of the skill, only noticing what is unusual or notable. This would allow us to note that the ball bouncing into the street might be followed by a child. Thankfully, we don’t have to use our conscious reasoning to step on the brake in time to avoid the child following the ball – that response would be much too slow! We can use our “RAS” (Reticular Activating System, which is a switchboard activating various brain areas) with an “emergency response needed” general message, without specifying which response might be best. If you go into a panic in emergencies and do crazy, unreasonable things, this means you need Alexander Technique lessons to “refresh” and “zero out” your ability to respond without answering too many conflicting habitual routines. Alexander Technique calms the brain’s RAS, so it automatically and intelligently chooses the more apt survival response in a split second. Or we can find ourselves doing the routine in a completely mindless way, with no memory of what it was like to learn in the first place. The strength of habit makes it possible to integrate more and more, as the routine fades into the background so we can add another habit onto what we now know how to do. Awareness makes it possible to notice, learn and integrate the next new challenge into the pattern, if we so desire. The advantage of awareness is it makes us effective teachers, good managers, great parents and compassionate with ourselves about learning new things. Awareness is the secret of being able to articulate describe and communicate what we know how to do. Our habits determine our behavior, yet we are mostly unaware of them. Brain science says the only 1/6th of our awareness is conscious – the rest is non-conscious and habitual. This can become problematic when non-conscious habits that interfere with our potential for health and happiness by running a program out of our control when it really doesn’t serve us. An example is the Disney Fantasia movie of the “Sorcerer’s Apprentice” where the character uses a spell to mop the floor and cannot cancel it. Self-observation and awareness are our pattern interrupts – the canceling spell for an ingrained habit. As we observe, describe and become aware of our habits, we gain the possibility of another way to go. Suspending or temporarily surrendering goals is often all that we need to choose a different way to react to a situation. Even if we ‘give in’ to our habits, we can use our awareness to observe the complexity of them, learning more about ourselves in the process. To the extent that we apply attention before habits get started at the beginning of an activity, awareness will work on it’s own as a turning point for free choice. As long as we can tolerate using our awareness of how we’re doing what we’re doing while in action, we can continue to shape, revise and grow. A technique to deal with very insistent habits that will not give up control comes from the example of what Alexander Technique teachers call “inhibition.” These techniques show exactly how to effectively subvert and free up routines, usually by running “under the radar” of our self-protective habits. One thing I’ve learned is that giving people the benefit of the doubt works well to educate. Treat people as if they are smart, and they will rise to the occasion. This works even if they must build entirely new contexts and environments in which to park an entirely new genre of thinking ability. Respect works wonders. This attitude came from my experience in first learning to write about Alexander Technique in 1980. Before anyone else I knew was doing so, there I was, sticking my neck out in a field where people said “it couldn’t be described.” It was definitely true that I needed some time to learn the craft of writing itself. But I was also attempting to describe a discipline that was subjective and mysterious. I wrote, and then I had people read it, and edited it again and again. Had over 400 people read and give me feedback on what I was doing. When people stopped pointing at the same spots in my writing, I figured I was done. It was very surprising how many people told me, “Well, *I* get what you’re saying, but would others?” They were imagining that the concepts were so new and so advanced that other people would not be able to understand. I took this comment as a request to simplify what I was presenting. But as time marched on, people began to be able to understand easier what I had been saying all along. Essentially, the social climate changed. I’m not sure it’s possible to teach the Alexander Technique in eighteen minutes, but I’d be willing to attempt it. Since pictures are worth a thousand words, came up with the idea to make a mind map to help that happen. This actually came from a very successful class series. In only five days, pretty much everyone in this Alexander Technique class learned the ability to come up with their own experiments that worked to uncover their own habits of what they were up to. The most amazing part was they learned how to re-direct themselves to get out of the rut too! Not sure if this sketch will make any sense to someone who hasn’t been to my Alexander Technique class series or hasn’t had Alexander Technique lessons. But I”m willing to put it out there so I can find out what you might have to say about it. Hey, if there’s anyone out there reading this, give me some comments on how this mind-map affects you. How does the content compare to what you know or have already learned about Alexander Technique? Talk to me.